Razer announced it has finalized Atrox, an arcade stick for the Xbox 360 designed in cooperation with the fighting game community. The device is now available for pre-order on Razer's website and will ship worldwide in June for $199.99 (199.99EUR). Razer™, the world leader in high-performance gaming hardware, software and systems, today announced the Razer Atrox Arcade Stick for Xbox 360®, the final product following an extensive beta testing program. Tested by some of the world’s best pro-gamers and Fighting Game Community members all over the world, the Razer Atrox Arcade Stick is constructed with modders and tournament gamers in mind. Featuring premium quality Sanwa™ components, the 10 highly responsive buttons and a precision eight-way joystick allow gamers to strike instantly and surely, game after game, while maintaining peak performance and reliability. An extremely moddable controller, the inside of the arcade stick platform opens up at the touch of a button, making the Razer Atrox a breeze to customize for all tastes and play styles. Users can swap in their own personal designs for a unique look, while also getting access to the internal compartments and honeycomb structure for easy screw mounting. The easily accessible internal compartment of the Razer Atrox reveals dedicated slots to store an included alternate bat top joystick, the detachable cable, and a screwdriver for modding, giving gamers plenty of room for storage as they travel around dominating FGC events. Arcade gaming has come a long way since its glory days– an era woven into the fabric of gaming history as one that paved the way for innovation, and also one that brought us bittersweet nostalgia. Hours spent at the arcade honed the gamer in you; for every coin you inserted, every combo you executed, every hit you took, and every ultra you unleashed in return – you became a better player. And this is the approach we took when designing the Razer Atrox Arcade Stick. 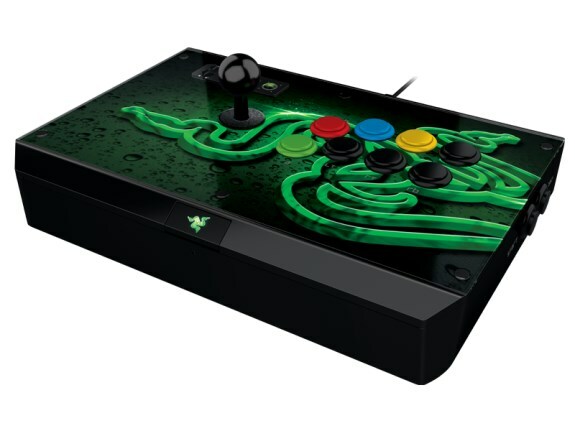 Years upon years of collective gaming experience from pro-gamers and you, the Razer community, have culminated in the ultimate Arcade Stick for the Xbox 360. Engineered and refined to perfection through countless prototypes and an extensive beta testing phase, the Razer Atrox Arcade Stick is crafted to allow advanced modification – With internals and storage easily accessible at the touch of a button, the joystick, all 10 buttons and the top panel are fully interchangeable for full customizability. And that’s just the beginning. Featuring genuine Sanwa hardware and an ergonomically authentic arcade layout, the Razer Atrox represents the pinnacle of precision and reliability and is the definitive Arcade Stick for tournament-grade gaming.